I’ve been getting all kinds of spam about tea. Oprah’s weight loss tea, amazing properties of green tea, Critical Health Information!!! — some of it is ridiculous. Of course, it’s dangerous for me because I have real email sent to me all the time about tea, and it’s sometimes hard to tell the spam from legitimate tea-related emails. Apparently I’m not alone in that assessment. I just got an email that used the word “T3A” instead of “TEA”–my guess is that spam filters are starting to use the word “tea” as a red flag for spam…and the spammers are using their tricks to make it through the filters. However, this means that legitimate emails about tea are likely to be more difficult to get through. That’s a sad thing. I offer this post merely as a heads-up, too. If you’re on my mailing list (and if you’re not you can join on the front page at www.teageek.net), or on other tea lists that are delivered by email, be sure to add the sending address (or domain name) to your “Safe Senders List” or “White List” or whatever the filter calls its list of folks who you want email from. 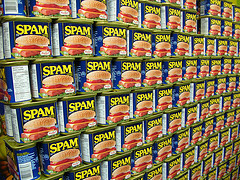 Posted on 29 April, 2008 Author Michael J. Coffey2 Comments on Spam Tea? 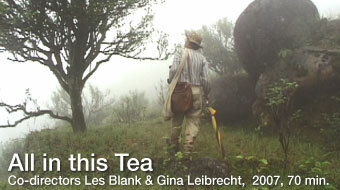 For those of you who will be in the Seattle area at the end of April, the film All In This Tea will be showing at the Seattle International Film Festival, April 23-24, 7:30pm. I saw the film a few months ago and while it certainly isn’t a comprehensive look at tea in general, and is a little personality-focused (it’s about David Lee Hoffman of Silk Road Teas more than it is about tea), I can heartily recommend it for tea beginners. For the more advanced tea geeks, there may still be a few “Oh, that’s cool!” moments unless you’ve already got experience trying to buy large quantities of good handmade tea from China. That is, in essence, the quest that Hoffman is on during this film. If you’re in the area, check it out! Also, you can pick up literature for the upcoming Northwest Tea Festival, which is co-presenting the film with SIFF.